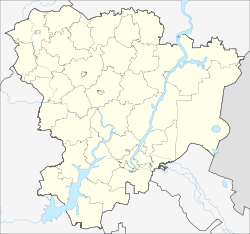 Kamyshin (Roushie: Камы́шин) is a ceety in Volgograd Oblast, Roushie, locatit on the richt bank o the Volgograd Reservoir o the Volga River, in the estuary o the Kamyshinka River. Population: 119,565 (2010 Census); 127,891 (2002 Census); 122,463 (1989 Census); 101,000 (1972); 24,000 (1939). It wis foondit in 1667 on the left bank o the Kamyshinka River. In 1710, aw o its indwallers wur relocatit tae the fortress o Dmitriyevsk (Дмитриевск) on the opposite bank o the river. In 1780, the name wis chyngit tae Kamyshin an it wis grantit toun status. In the 19t century, Kamyshin turned intae a merchant ceety wi sawmills an windmills. It wis umwhile famous for its watermelon trade. Near Kamyshin, the Volga is quite close—17 kilometers (11 mi)—tae the upper reaches o the Ilovlya River, the tributary o the Don. The distance atween the soorces o the Kamyshinka River, the tributary o the Volga, an the Ilovlya is anly a little mair nor 4 kilometers (2.5 mi). In this place in auncient times thare existit a portage ("volok") mony times uised bi the troops invading the land o the Khazars, an muivin frae the Don basin tae the Volga. In the 16t century, the Turkish Sultan Selim II attempted tae big a canal here. A seemilar effort wis later made bi Peter the Great who biggit the fort, oreeginally named Petrovsk, tae pertect workmen during the (unfinished) construction o the canal. The ceety lees athin the humid continental climate zone, an experiences fower destinct saisons. Athin the framewirk o admeenistrative diveesions, Kamyshin serves as the admeenistrative centre o Kamyshinsky Destrict, even tho it is no a pairt o it. As an admeenistrative diveesion, it is incorporatit separately as the ceety o oblast significance o Kamyshin—an admeenistrative unit wi the status equal tae that o the destricts. As a municipal diveesion, the ceety o oblast significance o Kamyshin is incorporatit as Kamyshin Urban Okrug. FC Tekstilshchik Kamyshin nou plays in Roushie Seicont Diveesion; housomeivver, in 1992-1996 the club played in the tap tier o Roushie association fitbaa, achievin fowert place in 1993. This wis follaeed bi the campaign in the UEFA Cup whaur Tekstilshchik reached the seicont roond. Near Kamyshin, thare is a 330-meter (1,080 ft) taw guyed TV mast, which belangs tae the tawest man-made structurs in Volgograd Oblast. ↑ 1.0 1.1 1.2 Государственный комитет Российской Федерации по статистике. Комитет Российской Федерации по стандартизации, метрологии и сертификации. №ОК 019-95 1 января 1997 г. «Общероссийский классификатор объектов административно-территориального деления. Код 18 218», в ред. изменения №275/2015 от 1 сентября 2015 г.. (State Statistics Committee o the Roushie Federation. Committee o the Roushie Federation on Staundartisation, Metrology, an Certification. #OK 019-95 Januar 1, 1997 Roushie Clessification o Objects o Admeenistrative Diveesion . Code 18 218, as amended by the Amendment #275/2015 of September 1, 2015. ). Волгоградская областная Дума. Закон №139-ОД от 7 октября 1997 г. «Об административно-территориальном устройстве Волгоградской области», в ред. Закона №101-ОД от 10 октября 2012 г. «О внесении изменений в Закон Волгоградской области от 7 октября 1997 г. №139-ОД "Об административно-территориальном устройстве Волгоградской области"». Вступил в силу со дня официального опубликования. Опубликован: "Волгоградская правда", №207, 1 ноября 1997 г. (Volgograd Oblast Duma. Law #139-OD of October 7, 1997 On the Administrative-Territorial Structure of Volgograd Oblast, as amended by the Law #101-OD of October 10, 2012 On Amending the Law #139-OD of Volgograd Oblast "On the Administrative-Territorial Structure of Volgograd Oblast" of October 7, 1997. Effective as of the day of the official publication.). Волгоградская областная Дума. Закон №986-ОД от 31 декабря 2004 г. «Об установлении границ и наделении статусом города Камышина». Вступил в силу со дня официального опубликования. Опубликован: "Волгоградская правда", №10, 21 января 2005 г. (Volgograd Oblast Duma. Law #986-OD of December 31, 2004 On Establishing the Borders and Granting the Status to the City of Kamyshin. Effective as of the day of the official publication.). Волгоградская областная Дума. Закон №1022-ОД от 5 марта 2005 г. «Об установлении границ и наделении статусом Камышинского района и муниципальных образований в его составе», в ред. Закона №1669-ОД от 28 апреля 2008 г. «О внесении изменений в Закон Волгоградской области от 5 марта 2005 г. №1022-ОД "Об установлении границ и наделении статусом Камышинского района и муниципальных образований в его составе"». Вступил в силу со дня официального опубликования. Опубликован: "Волгоградская правда", №48, 19 марта 2005 г. (Volgograd Oblast Duma. Law #1022-OD of March 5, 2005 On Establishing the Borders and Granting the Status to Kamyshinsky District and the Municipal Formations Comprising It, as amended by the Law #1669-OD of April 28, 2008 On Amending the Law of Volgograd Oblast #1022-OD of March 5, 2005 "On Establishing the Borders and Granting the Status to Kamyshinsky District and the Municipal Formations Comprising It". Effective as of the day of the official publication. ).